I washed my concrete with muriatic acid and didn’t get a color reaction when I applied Stone Tone™ Concrete Acid Stain. What happened? NEVER wash the concrete surface with muriatic acid if you plan on applying Stone Tone™ Concrete Acid Stain. Muriatic acid roughens the concrete surface and depletes the lime in the concrete. Because Stone Tone™ Concrete Acid Stain works by reacting with lime, cleaning with muriatic acid will prevent Stone Tone™ Concrete Acid Stain from working. More about Kemiko Stone Tone™ Concrete Acid Stain. Can I adjust the Stone Tone™ Concrete Acid Stain dilution rate, or do I have to dilute 1:1? Stone Tone™ Concrete Acid Stain is concentrated and will usually achieve colors close to our acid stain color chart when mixed at 1:1 (water: Stone Tone™ Concrete Acid Stain). However, all concrete surfaces are different, and yours may react differently. To achieve a lighter color, you may add more water to dilute the Stone Tone™ Concrete Acid Stain, and to achieve a darker color, add less water to the Stone Tone™ Concrete Acid Stain. Always color test Stone Tone™ Concrete Acid Stain in an inconspicuous area, especially if you plan to alter the dilution ratio. Why isn’t the Stone Tone™ Concrete Acid Stain reacting with my concrete? You can determine if there’s a penetration problem by spraying water on your concrete. If the water beads, instead of soaking in, there is a penetration problem. To fix this, sand the surface of your concrete with a sanding screen, black pad, or 100 to 120 grit sandpaper and re-apply Stone Tone™ Concrete Acid Stain. We recommend sanding a small section by hand to see if the pores open up and accept the Stone Tone™ Concrete Acid Stain before you sand the entire floor. Do this in an inconspicuous area, because it will be hard to blend that test spot in with the rest of the Stone Tone™ Concrete Acid Stain application. If the Stone Tone™ Concrete Acid Stain can penetrate the concrete but doesn’t react and create color, your concrete might contain additives like fly ash or slag. Additives reduce the ratio of lime in the concrete, which prevents Stone Tone™ Concrete Acid Stain from reacting. It’s not possible to use Stone Tone™ Concrete Acid Stain on concrete containing fly ash or slag. You might consider using Kemiko Buildable Overlay to provide a cementitious surface that will react with Kemiko Stone Tone™ Concrete Acid Stain. More about Kemiko Buildable Overlay. 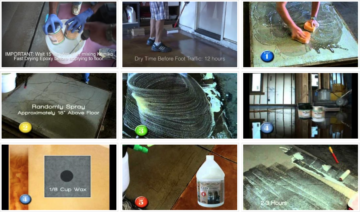 How much floor area does one gallon of Stone Tone™ Concrete Acid Stain cover? At the recommended 1:1 dilution ratio (water: Stone Tone™ Concrete Acid Stain), a gallon of Stone Tone™ Concrete Acid Stain will cover approximately 400 square feet of floor area with two applications or 800 square feet with one application. We recommend using two applications to achieve the best Stone Tone™ Concrete Acid Stain color. A section of my floor didn’t take the Stone Tone™ Concrete Acid Stain. How can I fix it? If your floor isn’t completely clean before applying Stone Tone™ Concrete Acid Stain, residue can prevent the stain from penetrating and cause spots where the color doesn’t develop. To fix it, try brushing your diluted Stone Tone™ Concrete Acid Stain into the area with a nylon or a chip paint brush. If the diluted stain still doesn’t color your concrete, try using the Stone Tone™ Concrete Acid Stain at full strength without dilution. If your color still won’t take in that area, sand the floor with 100 grit sandpaper to open up the pores of the concrete and re-apply Stone Tone™ Concrete Acid Stain. Stone Tone™ Concrete Acid Stain in Golden Wheat turned my floors orange. What now? Concrete has a bit of calcium chloride in the mix, and higher concentrations of calcium chloride can cause Stone Tone™ Concrete Acid Stain to turn a deep red or bright orange color. This is part of the reason why color sampling is so important before you start your project. To do color sampling, test the Stone Tone™ Concrete Acid Stain on an area of the concrete that will not be visible such as a spot in a closet, under stairs, or where you will be putting cabinets or appliances. If you notice that the concrete is turning orange or red and that is not your desired color, you can add Stone Tone™ Concrete Acid Stain in Green Lawn to the mix. Use up to 10% Stone Tone™ Concrete Acid Stain in Green Lawn to soften the orange color created by calcium chloride. If you have already applied Stone Tone™ Concrete Acid Stain to your floor and it turned orange, you can apply Stone Tone™ Concrete Acid Stain in Green Lawn on top to correct the color before you apply a Kemiko sealer. Dilute the Stone Tone™ Concrete Acid Stain in Green Lawn 10 parts water to 1 part acid stain and mist on top of the areas that turned orange or red. It may not remove the orange or red color entirely, but it will soften the warm tones. 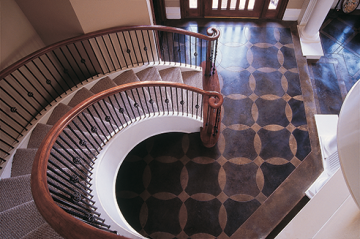 If my floors are already stained with Stone Tone™ Concrete Acid Stain, can I change the color? Floors that have been stained with Stone Tone™ Concrete Acid Stain can be re-stained to create a darker color but not a lighter one. First, remove any Kemiko sealer. Then, apply a Stone Tone™ Concrete Acid Stain color. To achieve a lighter Stone Tone™ Concrete Acid Stain color on a previously stained floor, apply Kemiko Buildable Overlay to provide a cementitious surface that will react with Kemiko Stone Tone™ Concrete Acid Stain.